Growing a beard is only half the battle. To keep it looking its best over the long haul — even if you are sporting a wild beard — you need to give your beard some ongoing care. Here are some tips to help you keep your beard in tip-top shape. Washing. It’s important to wash your beard regularly, especially in the early stages of first growing it out. Trapped food and skin cells can make your face itch. Wash your beard once a week using either regular shampoo and conditioner or a specialized beard cleanser. You can wash it more often, if needed. It’s also okay to rinse your beard every day with water. Drying. Pat your beard dry with a towel. Don’t overdo the drying, though, because that can lead to split ends and a frizzy beard. If you have a longer beard, you can use a blow dryer to give your beard a fuller look and help keep it tidy. Blow dry from the neck up. Moisturizing. To tame your beard, use a beard oil regularly. This will condition your beard, leaving it shinier and softer. You can choose from a variety of scents, including ones that will make you smell like a lumberjack. A beard oil with calming ingredients like safflower oil can also relieve itchiness. Dandruff. A beard oil should help with minor dandruff problems. But if you need something stronger, reach for an over-the-counter or prescription anti-dandruff shampoo. Wash your face first with a gentle cleanser to get rid of excess oil. Then apply the medicated shampoo, following the directions on the bottle. Trimming and shaping. Visiting your barber salon regularly for a trim will help your beard keep its shape. But you can also train your beard with a comb or beard brush. 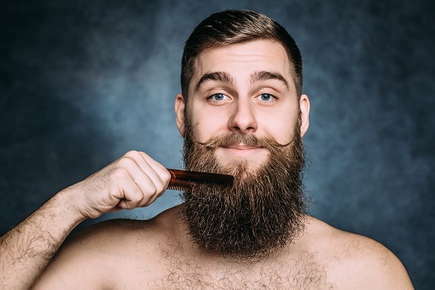 Gently comb or brush your beard every day to train your facial hair to grow in a downward direction. You can also use a sculpting beard balm to help tame fly-away hairs. If your beard is getting away from you, or your dandruff or itchiness is getting out of control, visit your barber for a little professional attention and some advice on keeping your beard looking sharp.